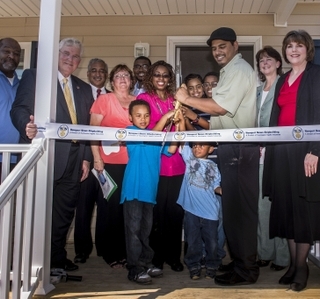 NEWPORT NEWS, Va., Feb. 19, 2016 (GLOBE NEWSWIRE) -- Huntington Ingalls Industries’ (NYSE:HII) Newport News Shipbuilding division joined elected officials and community leaders Wednesday to dedicate the 13th house shipyard volunteers have constructed in partnership with Habitat for Humanity Peninsula and Greater Williamsburg. 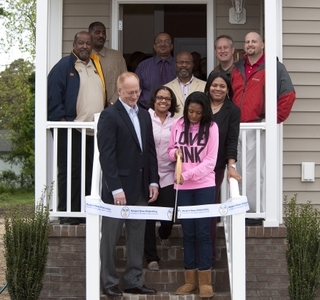 Wednesday’s dedication ceremony welcomed LaShand Coleman and her children, Dhestini and Dwayne “D.J.,” to their new home. In attendance were Newport News Mayor McKinley Price; Ché Henderson, president, Habitat for Humanity board of directors; Newport News City Councilwoman Dr. Patricia Woodbury; Karen R. Wilds, executive director, Newport News Redevelopment and Housing Authority; and Karen Joyner, CEO of the Virginia Peninsula Food Bank. 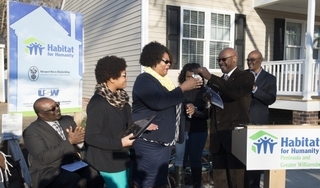 Ray Bagley, Newport News Shipbuilding’s vice president of trades operations, spoke on behalf of the shipyard and presented the house keys and a plaque to the Coleman family. LaShand said she is proud to call the house her own. “As a single mother of two, my heart’s desire has always been to own my home and have a nice place for my children to live,” she said. 2016 marks the first year that shipyard volunteers will complete two houses for Habitat for Humanity. 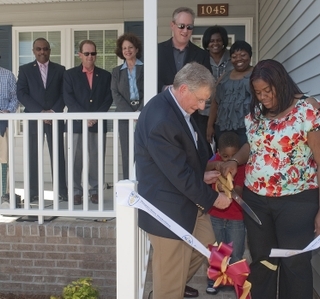 Newport News’ 14th house will be complete this summer.